This post is not about direct vocabulary instruction. Rather, it's about getting students to interact more with the new vocabulary they read in a text. My favorite way to do this using an informational text is with an activity I call "Words for Life." It forces students to give focus to the vocabulary they encounter as they read, and to analyze not just the meaning of those words, but their importance to the text as a whole and to students' own lives. Anyone who knows me knows I like a good list. (Learn even more about how I use lists in reading HERE.) And a list is the foundation for the Words for Life activity. As students read their informational text, have them keep a running list of words they want to remember the meaning of all day. Urge students to list words that are important in some way to the topic of the book. Some words added to their lists might already be familiar to students--that's okay as long as the words are important to the topic. Unfamiliar and brand new words should definitely be added to their lists. This initial list should be pretty long. Depending on the length of the text, 10-20 words are necessary before moving to the next part of the activity. 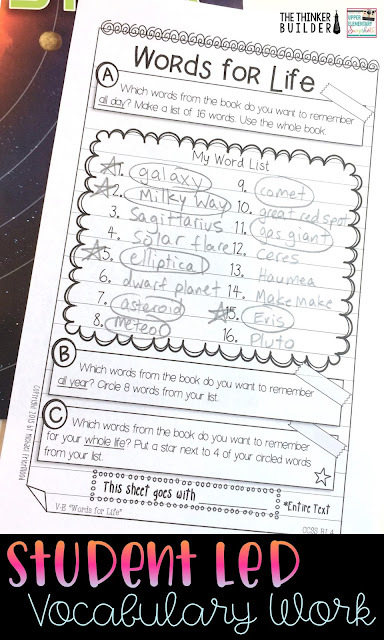 For example, for a book on the solar system that one of your guided reading groups is reading, let's say you require students to add 16 words to their list. Now we get to part of the activity where students must make some tough decisions. Have them look carefully back through their initial list and choose half of the words to circle as words they want to remember the meaning of all year. So for our example, you ask students to choose 8 of their 16 words to circle. Students must really think about which vocabulary helps them understand the topic the best, which vocabulary is most interesting to them, and which vocabulary is new and sophisticated and therefore important to learn. In the final round of cuts, now ask students to look carefully at their "all year" words and select just half of them to be the vocabulary words they want to remember the meaning of for their whole life. Have students put a star next to these words in their list. For our example, students will choose four out of their eight circled words to be their "words for life." In a way, starting with a long list of important words from a text, narrowing them to a shorter list and then narrowing them further, is like a "vocabulary summary" of the whole text. If you want, have students go further with their list. For example, with the final set of selected words (the "words for life"), have students do something with them. It could be as simple as rewriting them on a new page and recording the meaning of each one, or using each one in a meaningful sentence. Or you might ask students to write a summary of the text and use their "words for life" within it. You could also have students go further with analyzing their original list of words they chose. Try having students highlight them in different colors (or underline with markers), based on students' knowledge of the words prior to reading the text. For example, highlight words in pink that were totally unfamiliar to you, highlight words in blue that you've heard of but didn't fully understand, and highlight words in yellow that were familiar to you but still important to the whole text. 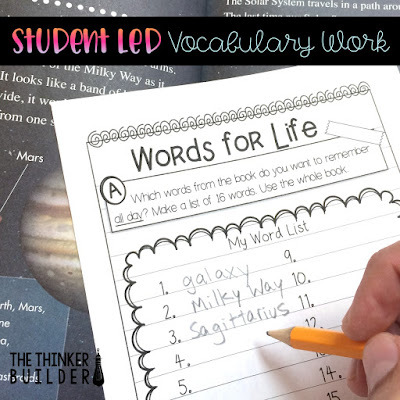 Students leading the way towards selecting the cream-of-the-crop vocabulary from a text flips the traditional model of the teacher being the sole "chooser" of which words are important for students to know and understand. Especially when students aren't all reading the same text, student-led vocabulary activities like "Words for Life" can help keep the vocabulary component of reading at the forefront. You can have students do the "Words for Life" activity in their own notebook, or if you're interested in the response sheet version shown in the photos, check out my Reader's Notebook Response Pages for Informational Text, filled with dozens of carefully crafted, differentiated response pages addressing a wide array of standards. 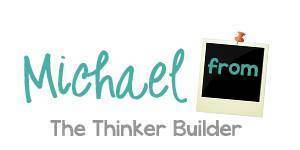 For more reading and writing ideas, come visit me at my blog, The Thinker Builder. 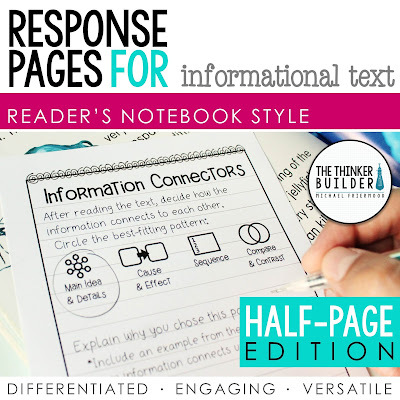 And while you're there, be sure to sign up for my FREE newsletter, and receive a mini-pack of my response pages as my gift to you!